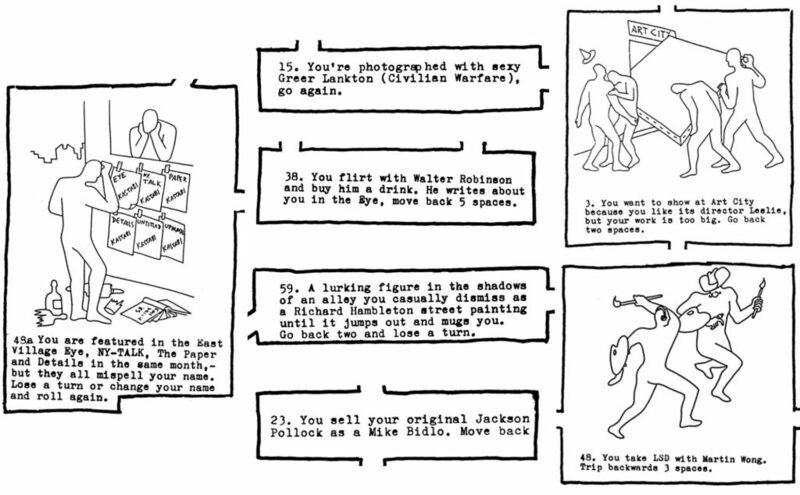 Selected panels from the “Artropoly” board-game poster, promoting the book East Village ’85. Drawings by Mark Kostabi. Text by Carlo McCormick, with Walter Robinson and Paul Benney. East Village ’85. Edited by Roland Hagenberg, with essays by Alan Jones, Michael Kohn, Carlo McCormick, Nicolas Moufarrege, and Jo Shane. It was inevitable that the East Village art scene of the 1980s would make a comeback: it was just too much fun, and too profitable. Not only does Howl! Happening now have an exhibition about the East Village Eye—whose succession of arts editors, including Walter Robinson and Carlo McCormick, charted the scene’s ebbs and flows throughout the decade—but Robinson himself is subject of a painting retrospective at Deitch gallery. 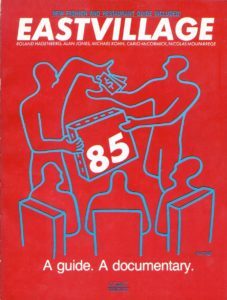 Digging into our inventory of art and ephemera, Gallery 98 resurrects two totemic artifacts of the era: Roland Hagenberg’s East Village ’85, and the “Artropoly” board-game poster published to promote it. Check out the book and poster on Gallery 98’s “Recent Additions” page, which also features other innovative projects from Hagenberg’s mid-’80s New York stay. 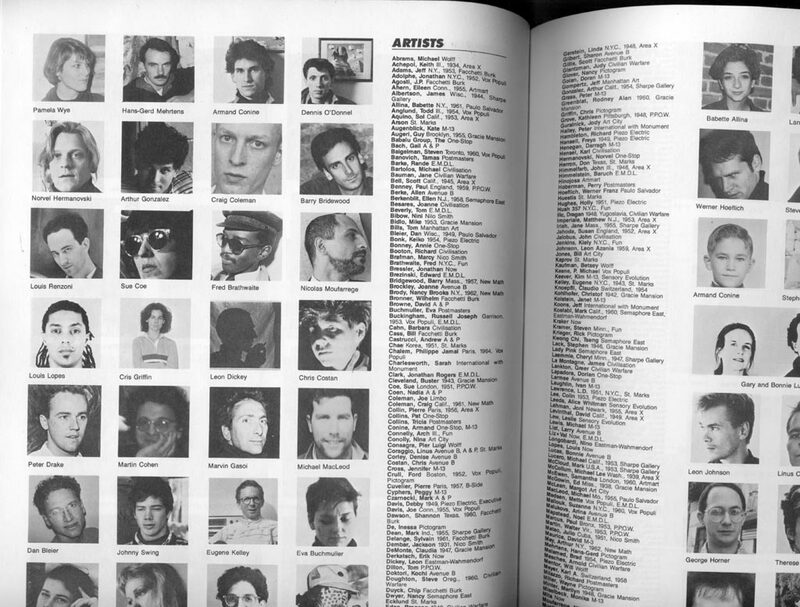 Pages from East Village ’85. 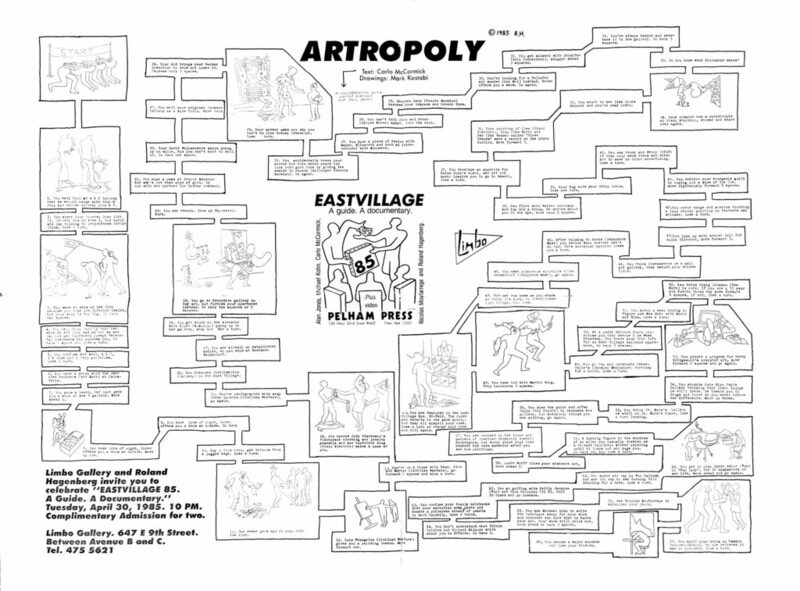 “Artropoly” poster, 19″ x 25″. Drawings by Mark Kostabi. Text by Carlo McCormick, with Walter Robinson and Paul Benney.